I've been on this site for 10 years. I have an original Colt Delta that I picked up in 1989 which started my love affair with 10mm. When it was first announced that Sig was offering the P220 in 10mm, I couldn't have been more excited. All that being said, I'm extremely disappointed that so many of these models are SAO. I never imagined that they would have ignored their classic DA/SA action on the initial release. The middle all stainless pistol is exactly what I envisioned buying on day one. That was until I saw that it was SAO. I'm not a Sig basher. I have an original Sig556 with the ugly fish gill hand guards but built with the early Swiss parts. I even initially loved the look of the pre-release photos right here that showed the elevated rail. When the release came out, some of the actual changes were not what I expected, but I still happily jumped on the bandwagon. I was fully committed to jump on the first 10mm release seeing as how I have so many Sigs as well as 4 other 10mm pistols. But for them to so ignore their classic action is very disappointing. The two tone isn't bad. But at this point, I guess I'll have to wait to see if the version I really want is ever released. I'm hoping they get enough feedback on these early models to correct this gross oversight on expectations. I never imagined that they would have ignored their classic DA/SA action on the initial release. But for them to so ignore their classic action is very disappointing. . I will say I'm not fully convinced that what we see here is what we will get. I can't understand why we would have a SAO version with night sites, yet the DA/SA version is shipped with adjustable sites. That seems backwards to me. I'll continue to take a wait and see attitude towards what is released. It can be argued that the differences between the two tone model and the all stainless are minimal. Grips can be changed and I've always liked the reverse two tone look. Perhaps I will settle if those are the only options. I'm just very surprised at the original offerings as they are presented here. I've seen enough pre-release/Shot/NRA examples from Sig that do change prior to release that I'm hopeful the feedback they get may make a difference. I'm a little surprised by three of the four being SAO too. I guess Sig sees this as more a hunting caliber which would also be surprising to me as I understood from prior posts Sig was not building this pistol for full strength 10MM ammo. Me, I'm just happy the DA/SA version is coming in reverse two tone with adjustable sights. Sonny Crockett, eat your heart out. I will say I'm not fully convinced that what we see here is what we will get. I have the same impression, which is part of the reason why I am telling you guys to not get discouraged. I'm not discouraged but how do we let Sig know what configurations we would prefer? Personally, I think they should keep it simple, fixed sights and either completely Nitron finished or Stainless finish. The end user can then decide whether to add target sights or have it custom finished on their own. As it is, I wonder how they decided on the configurations that are in that picture? Is it based on what are the best selling configurations for the P220 or what they think a typical 10mm purchaser would want? Right now, I'm liking the P220 Elite in either black or Stainless. I even like the two-tone DA/SA pistol and would get that but I don't want target sights. I'm not discouraged but how do we let Sig know what configurations we would prefer? If SIG is following this thread, my preference would be a classic DA/SA with night sights. My sprinkles would be all nitron or all natural stainless. Me too - just thinking of a 10mm DA/SA similar to my 220, 226, & 229 SSE's gives me a firearm stiffy. How would you like your P220 10mm configured? Exactly dwp10mm, I have always wondered myself why a DA/SA in 5 inch length would have target gun like sights on it. And that darned skinny trigger too. This should be more of a single action gun for target or USPSA or taking game. Another thing about these target style sights is they should be black of color and not dotted. Para, being a 40 caliber bored pistol, will these come with a bit heavier barrels? To address what I believe is the cupcake and leaving the sprinkles out of it, it’s obvious that the SIG designers and I have very different ideas concerning the purposes that shooters might purchase this gun for. 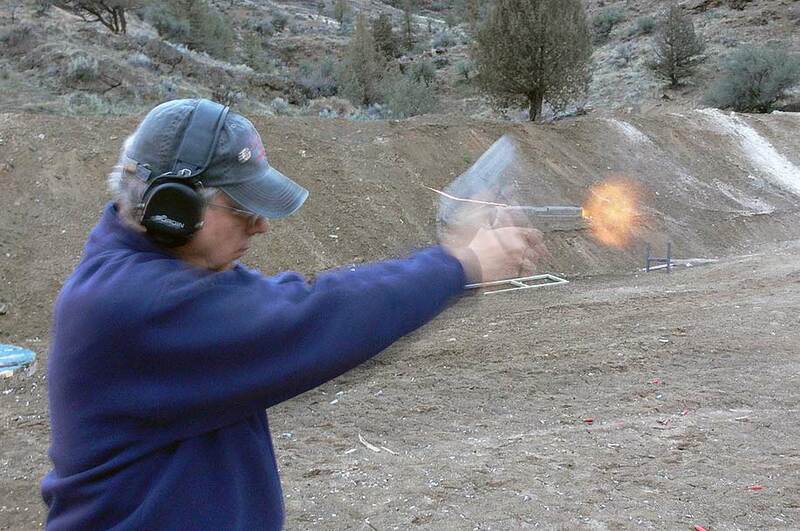 The vast majority of shooters will purchase a pistol chambered for the 10mm Auto for one of two purposes: just to “have” and shoot occasionally, or to use as a defensive weapon. The 10mm Auto has never to my knowledge been considered an ideal cartridge for competition or other sporting purposes. Unless the shooter handloads and turns it into something that is already fulfilled by other cartridges, it’s generally too rare and difficult to find, it has too much recoil, and it doesn’t enjoy the advantage of the largest-diameter bullet that the 45 ACP offers for shooting at paper. The shooter who just wants such a pistol to take to the range occasionally and say that he has one will obviously be much more concerned about the sprinkles: Whether it is all black, all silver, black on top with silver on bottom, or silver on top and black on bottom are important concerns for him. Having target sights may also be critical even if he will never shoot it at anything other than a B-27 silhouette at 10 yards. I submit, however, that the people who purchase a pistol chambered for 10mm just to impress themselves and their shooting buddies will be a minority of the gun’s customers, especially as this offering is evidently going to be priced higher than similar pistols. The other reason people will purchase a 10mm SIG is to have a defensive weapon that’s significantly more powerful than what’s traditionally been available in SIG’s Classic line. Although there are a few true believers who will always maintain that it makes no difference in a self-defense shooting whether an attacker is shot with a 32 S&W or a 500 S&W, most people who are drawn to the 10mm Auto owe that attraction to its greater power than the four common autoloading pistol defensive cartridges (9mm, 357 SIG, 40 S&W, 45 ACP). The only reason that I, for example, am giving any thought to purchasing this new SIG is because it would be better as a wilderness defensive handgun than any other autoloading pistol I’m currently aware of. I wouldn’t want to rely on it in grizzly country, but although I have an original S&W “Mountain” revolver in 44 Magnum, I still believe that the greatest danger in almost any situation is posed by two-legged predators. To satisfy the unavoidable compromise between defending myself against two or three people and a black bear or mountain lion, a 10mm P220 would come about as close to ideal as possible. Other people aren’t concerned about defending themselves against animals of the four-legged sort, but still want a powerful weapon because they know that power is the ability to do work, and when the work is neutralizing a deadly threat, often the more power the better. Once, therefore, we understand and accept the fact that many people are considering this gun for its potential as a self-defense weapon, then we need to look at the cupcake. A 4.4 inch barrel rather than 5 inches isn’t a handful of sprinkles because how many concealment and LE duty holsters are designed for a 5-inch P220? Fixed sights aren’t sprinkles because they’re more rugged and they inhibit the endless tinkering that adjustable target sights encourage. Front gripping ridges aren’t too critical, but I believe they’re a useless affectation that causes unnecessary holster wear. An all-black finish and the absence of a ducktail are straying into sprinkle territory, but the simple fact is that some people (like me) will make their ultimate decisions about a defensive handgun based on such factors. Another major cupcake feature for me is whether the gun is compatible with the DAK trigger system. If I can change it to old-style DAO, that might be acceptable, but when the time comes to exercise the credit card …. The pistols pictured above are configured to satisfy the virtually nonexistent users who would want their features for high-level competition and the somewhat larger group of shooters who would buy such boutique guns to make them the queens of the royal courts tucked away in their gun safes. They’re not for the people who want a reliable and more-powerful-than-most autoloading pistol intended for serious defensive purposes. Please don’t forget those of us who do. Sigfreund speaks the language of my heart. For me this is primarily for social work. Perhaps Sig thinks it is too heavy for every day carry. Hogwash. My current EDC is a P226-SSE in 357. But if I can get more punch from the 10mm, I'll take it. Can anyone confirm whether it has been engineered for heavy loads. My biggest concern is a gun that won't do what all my other 10mm have done for years. The whole point of 10mm is diversity of loads. I'm missing the point without it. Sigfreund has stated in his own well written words exactly what I think about it. I want a user, a simple, reliable, user, by Sig, in 10mm, on the P220 platform. That's it. No Rainbow Titanium, or (ugh) Camo - or worse FDE, just a big honking stainless 10mm. I won't be attaching any lasers or lights or NV goggles, won't be entering any competitions (style or shooting), I'll put it in a holster or in my truck and USE it. As Sigfreund said, please don't forget about folks like us.